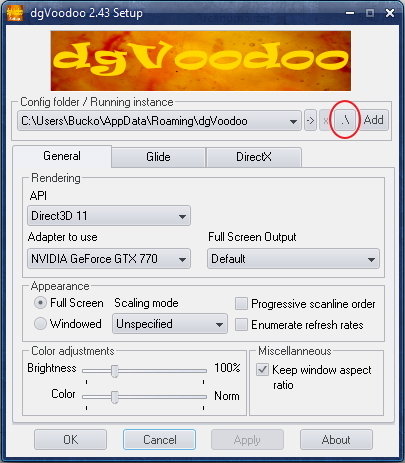 dgVoodoo is a legacy DirectX and 3DFX Glide wrapper program. The purpose of this software is to translate or wrap function calls to old, legacy graphics API (application programming interface) functions into calls to the much more modern Direct3D 11. In other words, it acts as a translator, changing old games to run with newer, modern graphics techniques. Using the wrapper is very easy, and you can try it with any game that uses DirectX or Direct Draw versions 1 to 8, or any game that uses 3DFX/Glide. Of course, since this software uses Direct3D 11, you will need a graphics card or chip capable of using this version of DirectX. To get started, download the latest version from the gdVoodoo homepage here. At the time of writing, the latest version was v2.43. The file is downloaded as a zip file, once downloading is complete, open the zip file in file explorer. You should see the following folders. If you’re trying dgVoodoo with a DirectX game, then you should open the “MS” sub folder and copy all the contents to your games installation directory. If you’re trying a 3DFX/Glide game, then copy all the files from the 3DFX folder instead. Do NOT under any circumstances copy the dll files inside the MS folder to your PCs system directories (anywhere within the Windows folder). Finally, copy the dgVoodooSetup.exe file into your games installation folder too. This makes it easier to configure dgVoodoo for your specific game. As long as you copied the .dll files to your games installation folder correctly, all that you need to do to run the game in dgVoodoo mode is to simply start it. Of course, not every game is compatible, so it’s usually just a matter of trying the game out and seeing if it works. To remove dgVoodoo from a game, just delete the .dll files you copied in. 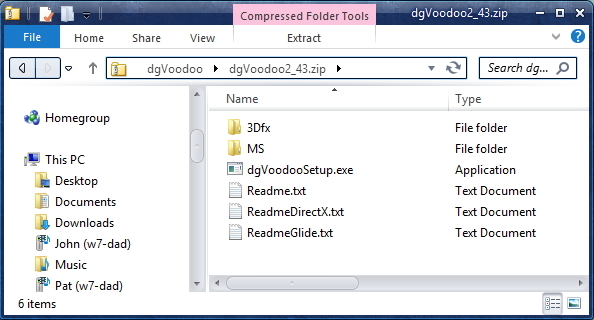 You can configure dgVoodoo by running the dgVoodooSetup.exe program from within your games installation folder. Technically this program doesn’t need to be in your games installation folder, but it is the easiest way to use it. Run the program and the following window will appear. Before you get started, click on the button circled in red in the picture above. This makes sure the configuration file is written to the correct folder. The options that you configure are generally set on a per-game basis and may need some experimentation. There is one important option you may wish to change for every game however. Over on the DirectX tab there’s the option “dgVoodoo Watermark”. This applies a watermark to the games graphics in the bottom right hand corner of the screen. While you are configuring dgVoodoo we recommend leaving this option on, as it is a good indicator that the wrapper is working correctly. Once you are happy that everything is configured and working, you can then disable the watermark and play your game. Since dgVoodoo makes old games use newer versions of DirectX, it can also enable compatibility with certain in-game tools and utilities. For instance, when a game is running through the dgVoodoo wrapper, it becomes compatible with the Nvidia Shadowplay screen recording software and the excellent in-game overlay Evolve. Finally, was able to play old games in stereoscopic 3d on my main machine! After using this tool, the game launches well, but i am unable to use my mouse and keyboard to play. I get errors on the top ‘error in binding’. I’ve encounter a similar problem,not in-game but if I tab out of the game and leave it running (so dgVoodoo 2 is also running), my mouse cursor disappears in some windows and I can’t use my keyboards in any other open windows. Not sure what that is about. In-game it’s been fine for me, but I do think there is an issue here that I hope the devs address. It looks like dgvodoo 2 doesnt work with amd videocards. I have an AMD 7800 series with updated drivers on my main rig and after I updated from Win7 to Win10, I couldn’t play Syberia without getting an error message. I was able to get Syberia running with the latest version, dgVoodoo v2.53. By system directories and windows folder you mean the “Windows (C:) harddisk” or the “Windows folder that’s inside the Windows (C:) hardisk ? Anywhere within the Windows folder that’s inside the Windows (C:) hard disk. You should copy them to your games installation directory only. But what do you mean by the installation directory of the game, the game file ? where you have the data docs ? Because I want to use it for desperados and the game file is in the Windows (C:) hardisk. Installation directories are typically found under the Program files or Program files (x86) folders. Hello, I wanted to ask when I use dgvoodoo on the following video games Mace Griffins Bounty Hunter and Mortyr 2 my frame rate drops. Is there a solution for this I noticed it before on some games but since these two games are first person shooters the low frame rate is quite annoying. Thanks you so much for the very clear and simple explanation. Finally I can play Syberia. Works very well. i applied some glide settings and i dont know what i did. it might be bad and i want to reset them to default and delete the files that it created.i didnt know that i need to configure the directx settings. where are these glide files and what to do? Delete the dgVoodoo.conf file to reset the settings back to default. Try the page for that game there’s a replacement installer. I am sorry if this is the wrong place to ask. However, I am having some issue running “Donald Duck: Quack Attack” and I’m hoping someone can help me out. “Display initialisation error: could not find any resolution. I have the same problem with Quack Attack. Did you get it to work yet? The watermark won’t go away even after I uncheck the box for it. Why the hell won’t it go away?????? Make sure you’re saving the dgVoodoo2 settings in the correct folder. Hey so I have the Original discs for Star Wars Dark Forces II used the alternative installer to install it and the menu would appear, but gameplay I got a black screen but showed the HUD. So tried the Voodoo wrapper and now the menu is completely black… did all the things suggested, but can’t figure it out… not using any enhancements, just looking to run through the game like back in 99. Any suggestions? I have Desperados in CD version. When you said : “put in the game folder” is it the folder who the name is “game” or the main folder ? When i configure voodoo, it must to clic on “apply” and “ok” for finish use the launcher (exe?) . Or Just apply and reduce the voodoo application ? Always put dgVoodoo2 in the games folder, never in the system folder. You do not need the dgVoodoo2 preferences program to be running in order to use dgVoodoo2. I’m unable tu unzip any .zip of dgvoodoo website. Could be a conflict with your antivirus software. Many antivirus programs consider replacement dlls to be suspicious. You may need your administrator password if Windows UAC prompts you. If you don’t know it you will need to ask whomever owns the computer for it. For some reason the latest version v2.55.2 has a password protected archive with the password not posted anywhere. Use v2.55.1 for now. What is the password to allow me to extract dgVoodoo2_55_2.zip? I don’t mean the admin (which I am) password, but the one that the person who posted it asks for that lets the program be unzipped. I need the password to extract dgVoodoo2_55_2.zip. I don’t mean the admin (which I am) password, I mean the one that is required by whoever created the zip. I have tried 3 different websites that have the dgVoodoo zip files and none of the versions have the dgVoodooCpl.exe included in the downloads, does the exe file actually exist? The download from the official site always has this.